The Sony PTZ SRG300H is a 30x 1080p/60 HD Pan/Tilt/Zoom Camera. It has a high sensitivity 1/2.8-type Exmor CMOS sensor with the newest technology. The SRG300H is available in black and white. The new SRG series joins Sony’s widely used EVI and BRC product lines, giving customers a greater choice of high-quality remote camera options. The SRG-300H/W is a new desktop and ceiling mount 1080p/60 HD PTZ white camera with a 30x optical zoom. 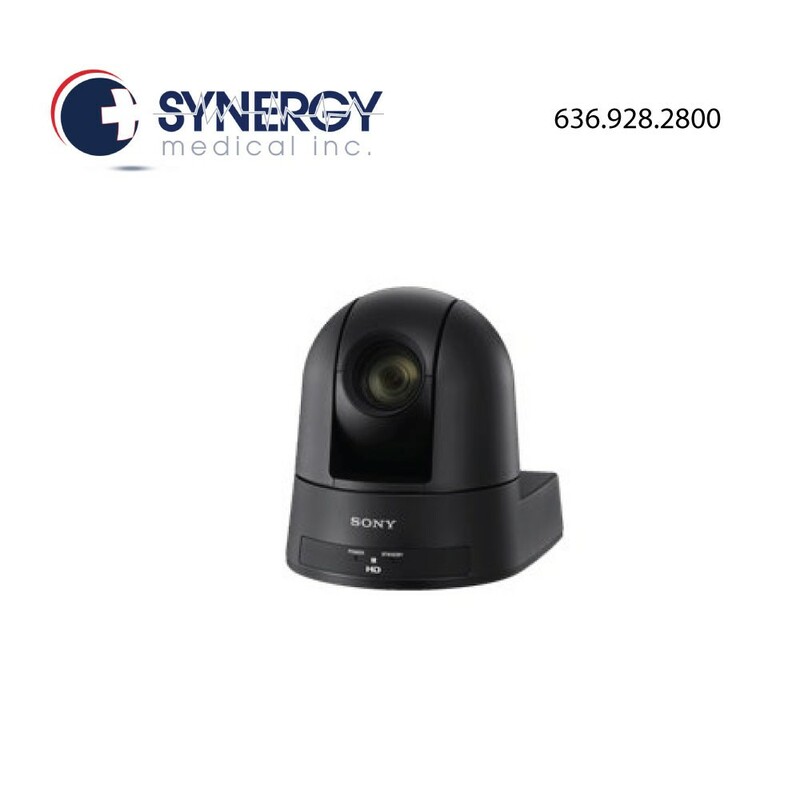 It incorporates Sony’s high sensitivity 1/2.8-type Exmor™ CMOS sensor with the latest imaging technology and field-proven operability. The SRG-300H/W is equipped with several new features including View-DR processing to master the harshest lighting conditions as well as the industry recognized VISCA™ protocol and built-in IP control. In addition, the SRG-300H is available in a black or white housing. Compatible controllers include the CPITV4S, RMBR300 and the RMIP10 IP controller. The SRG-300H/W is ideal for house of worship, videoconferencing, distance learning, entertainment/seminar venues and remote monitoring of small to medium sized rooms. High Image Quality: The SRG cameras incorporate Sony’s high-sensitivity 1/2.8 -type Exmor CMOS sensor and the latest View-DR™ technology. Also their 60p shooting capability realizes smooth, reduced blur life-like images. – Utilizing the Exmor™ CMOS sensor’s high-speed readout capability and Visibility Enhancer (VE) that provides a high level of chrominance and luminance.Achieves up to 130dB. – (29.97fps) XDNR™ Technology: XDNR technology reduces noise and provides clear images in both moving and still objects under low light conditions. – Camera Control: VISCA over IP technology allows for control of the camera over an IP connection. The MCC-500MD has enough output flexibility to fit a range of medical environments, with HDMI, HD-SDI (3G-SDI), S Video, and Composite video connectivity. Furthermore, Full HD (1920 x 1080) quality 60-fps progressive scan technology results in smooth images with reduced blur when HDMI or HD-SDI is used – ideal for viewing fast- moving images. All of the camera’s outputs are active simultaneously, so it is ideal for use with 2nd or 3rd monitors in the operating room. Together with Sony’s medical-grade recorders and monitors, the MCC-500MD is the ideal solution for capturing and recording microsurgery applications. The MCC-500MD’s compact and light-weight design allows the camera’s C-mount head to be easily mounted on most existing surgical microscopes. The HD 1 CMOS Camera with 15m Cable - MCC500MD/15 Medical Grade 2D Camera is a 1/2.9-type Exmor Full HD CMOS image sensor, with an effective pixel count of 1920(H) x 1080(V), to deliver high-quality images.Compact and Lightweight Camera Head Unit, Wide Variety of Video Formats – from SD to Full HD (1080/60p). The Picture Profile feature allows you to easily call up customized picture-tonal settings to suit particular shooting conditions at the touch of a button via the front panel. Up to six different settings (such as parameters including exposure, sharpness, gamma, and white balance) can be saved/loaded into the camera memory. Equipped with an RS-232C connector to enable control from an external host device such as a computer. Panasonic GP-UH532 4K Specifications We offer special pricing & volume discounts for Government, GPO, Health System, & Healthcare Facilities. Contact us for details.